Theoretically you know that every little thing you do on your horse affects him. But how often do you give yourself uninterrupted time to work on your seat, without worrying about what your horse is doing? The best way to do this is to work on the longe line. The time-honored tradition of longe work can make a vast difference not only in how you sit, but in how your horse goes. 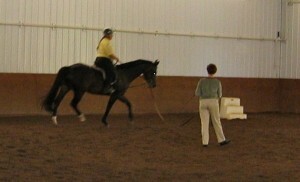 Longing is the best way to work on building the rider’s awareness, strength, flexibility, balance and coordination. I’d like to give you some new ideas for working on your seat from an Alexander Technique perspective. The Alexander Technique goals of balance, integrated coordination and suppleness in the rider align beautifully with the similar goals we have for the horse. The first step toward realizing these goals is freeing the body of unnecessary tension to use the appropriate amount of effort. The best way to use this information is to have your longe partner read it too, so that she knows what you’ll be working on. If you don’t have a longe partner, this is a great opportunity to ask a friend or colleague who may also want to work on her seat in this way. Before tacking up, take a few minutes to explore a bit of anatomy—your poll joint and your hip joints. Both humans and horses have a head/neck joint that is crucial in balance. On the horse we call it the poll. On us, it is the atlanto-occipital joint. Notice in diagram 1 where the base of the skull meets the top of the spine. It is very high up, almost between the ears, above the jaw bone. Take a moment to find this spot by running your hand up the back of your neck until you feel the little indentation beneath your skull. This part of the skull is called the occiput and the first vertebrae of your cervical spine is called the atlas. The atlanto-occipital joint is even higher up and further inside your skull than the indentation you can feel. Now put your fingers just in front of your ears. Your atlanto-occipital joint is here, between the ears, and behind the roof of the mouth—much higher than we usually think! See how high up the neck goes to connect with the base of the skull. See if you can nod your head a few times from this very high spot—it feels different than how we normally nod—usually we nod from about the height of the jaw line. Notice that you can release the muscles surrounding the base of the skull as well as around your whole neck, including your jaw. Now you have a free poll. Because of the startle pattern that we humans share with horses and all other vertebrates, we are often a little tight in the neck and jaw. When we are startled, tense or stressed, we tense up and contract our muscles inward. We curve inward, protecting our organs. Our shoulders hunch up and our head recedes down like a turtle to protect our neck. Our limbs draw in close to our torso, again protectively. In this tense state, our head is contracted downward onto our neck, which gets compressed into the spine. But our necks need to be free of excess tension for the sensory and motor nerves to respond properly. So it’s important to release the often-contracted muscles and begin your riding from an easy neutral, rather than a contracted or compressed state. Now bring your attention to your hip joints. Your hip joints are deeper and lower than most people think. Put your “hands on your hips.” If you put your hands on the pointy bone that sticks out, you’ve put you hands on the top of the Iliac crest, the top of the pelvic bowl. See diagram 2. Slide your hand down and in to the middle of the crease where your legs meet your torso. Deep within is where your hip joints allow your thigh bones to roll and release from the pelvis. Stand with your knees slightly bent, your hands resting in the hip crease. Tighten your thigh muscles and feel how the thigh bones draw up toward the pelvis. Stop tightening, or “un-do” your thigh muscles. Notice how your thigh bones release away from the pelvis. Put your hands on the outside of the thighs and tighten your thigh muscles again. Notice how the thigh bones draw in toward each other. Now release those muscles and shake out your legs. Take a short walk around and think of how you’d like your horse to go, with free swinging limbs and a supple poll. Imagine that you are your horse, going with relaxation, freedom, springiness, attentiveness. How does it feel in your body? Do a compare and contrast to see what it feels like to be scrunched in and then released. Imagine you are startled by a big noise and let your body respond by tightening and pulling in. Notice your neck and head coming down onto your spine like a turtle, your shoulders hunching up and your legs coming in to your pelvis. Now let all that release, adding a little nod at your poll, ease in your jaw and allowing your legs to release away from your hips. Even if you think to yourself, Well, I don’t go around like a turtle before I ride, you may want to reconsider. Most of us are in a mild startle pattern much of the time. Modern life is full of over-stimulation, stress, tension and anxiety. Even if you take a yoga class in the morning, by the time you get to the barn in the afternoon, you probably have been slightly startled or stressed somewhere in between. Even 10% of the full startle pattern is enough to communicate stress and tension to your horse. You can think of saying no to tension by un-doing contraction in your own poll joint and releasing your legs away from your hips anytime during the day. This will help you to get the feeling in your body so that you can practice it on your horse. Now that you’ve explored the anatomy that we will be discussing on the longe, you’re ready to tack up and take your horse to the arena. Longe the horse for a few minutes without a rider or side reins. Then add the side reins and longe him for another minute or two. When he is going calmly and obediently, it is time to mount. Before you mount, stand next to your horse and remember that you can free your neck muscles, jaw and poll joint. Breathe and allow ease in your joints. As you put your foot in the stirrup and get ready to hop up, think about letting your poll continue to be easy and think to let your head lead your body upwards in your mount. When you are mounted, cross your stirrups at first, so that you can practice lengthening your legs. Later, you may want to practice with your stirrups again. Have your longe partner ask the horse to move out at a walk. Since your partner is controlling the horse, you can now attend to the use of your own body and not worry about how the horse is going. While at the walk, do a few simple exercises, like circling your head, your arms, and your ankles. As you do these movements, continue to bring your attention back to your poll joint, noticing when this area tenses and then un-doing the contraction. Notice that the un-doing of the neck muscles allows your head to float easily upwards, and that your head going gently up allows your spine to lengthen. Think of allowing ease and spaciousness rather than pushing or forcing. Bring your attention also to your pelvic bowl, allowing your sitz bones to rest deeply but softly into the saddle as you allow your legs to release away. The hip joints should feel open, the muscles along the whole leg, releasing down toward some weight in the ankles. Think of your outer thigh muscles coming from your sacrum, or base of the spine, releasing down past your knees and into your feet. Also think of your inner thigh muscles releasing from your pelvic floor down past your knees into your feet. As you ride at the walk, allow your awareness to keep circling around, from your head/neck joint, to your easy jaw, to your long spine, to your gentle, full breathing, to your legs releasing, back up to your head/neck joint. You “toggle” your attention back and forth between several things. When you practice in this way, you will find that it gets easier to keep more than one thing in mind and body at the same time. And eventually these things become your new habits! Whenever you notice tension, think of un-doing the muscles and re-directing them into length and ease. The idea is that you bring a clear intention to this, not push or try hard. As you practice sending clear intentions, your joints will feel more open and spacious and you will be using the appropriate amount of effort, not more. Your muscles should feel toned, not completely relaxed, not over-effortful. 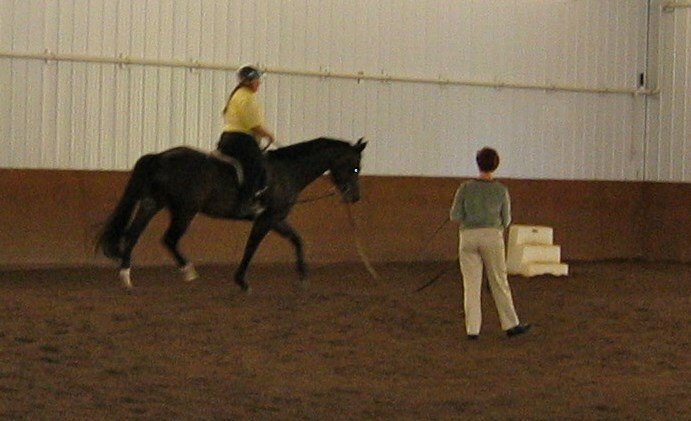 When you are ready to trot, practice the same principles. Notice, un-do, re-direct. These three words correspond to the classic Alexander Technique principles of Awareness, Inhibition of Automatic Habit and Conscious Direction. In any activity, you can practice bringing awareness to your habits, pausing to un-do that habit or pattern and then re-directing yourself into a better coordination. In general, most of us contract and compress ourselves more than is ideal. You can notice when this happens, pause to un-do the compressive pattern and release into expansion. Practicing these three principles in your daily activities is helpful to build the skill of mind-body awareness and ease of movement that you want to cultivate in your riding. We have covered just a few aspects of learning the Alexander Technique. If this work appeals to you, write to me about setting up a workshop in your area.